October 1. No snow on the ground. Good. Although I am dreaming of big pots of warm soup and the smell of curries on the stove. What I love about fall and winter is that cooking gets a bit easier but more creative at the same time. There is so much to be made on the stove and in the oven, which we try to use less of in the summer. The BBQ reigns supreme from veg to fish and fresh salads are a staple. The markets are full of root vegetables and squash at the moment. We ate a medley of fresh beets from our garden and baby potatoes last weekend, cooked on the BBQ of course. I did get some food experiments in the last few weeks. My favourite has been Chia Seed Pudding. I bought chia seeds in my last nut and seed order from Real Raw Food months ago, but they can be found at most health food stores now. Chia seeds are all the rage at the moment in healthful cooking. You’ll remember the sprouted version as ‘chia pets’ growing up. These little tiny seeds are packed with omega 3-fatty acids and a-linolenic acid (ALA), both essential fatty acids believed to be important for metabolism. I did a bit of research on what to easily do with them. Adding them to my green smoothies or to my breakfast seed/nut mix was too easy. 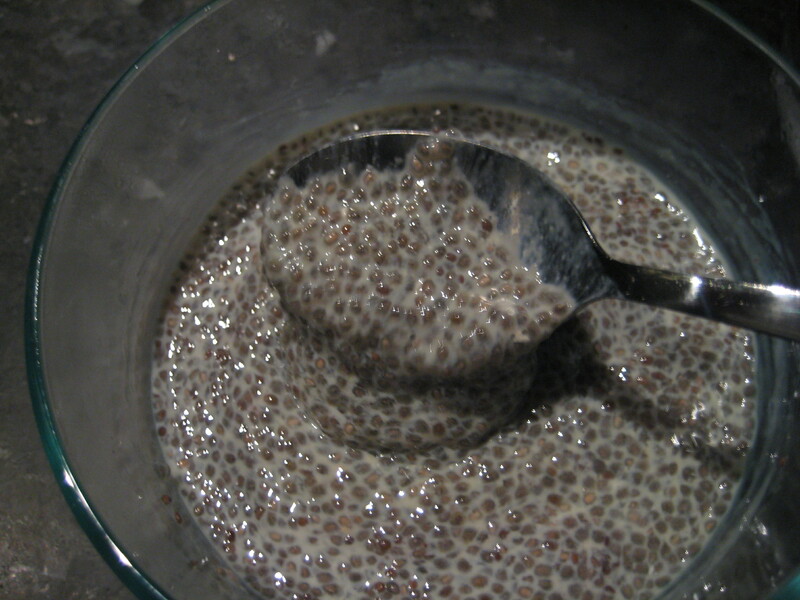 Then I came across this fun chia seed pudding recipe from Happy Healthy Life vegan blog. A sweet blog with a bunch of great recipes and healthful advice. I highly recommend it. 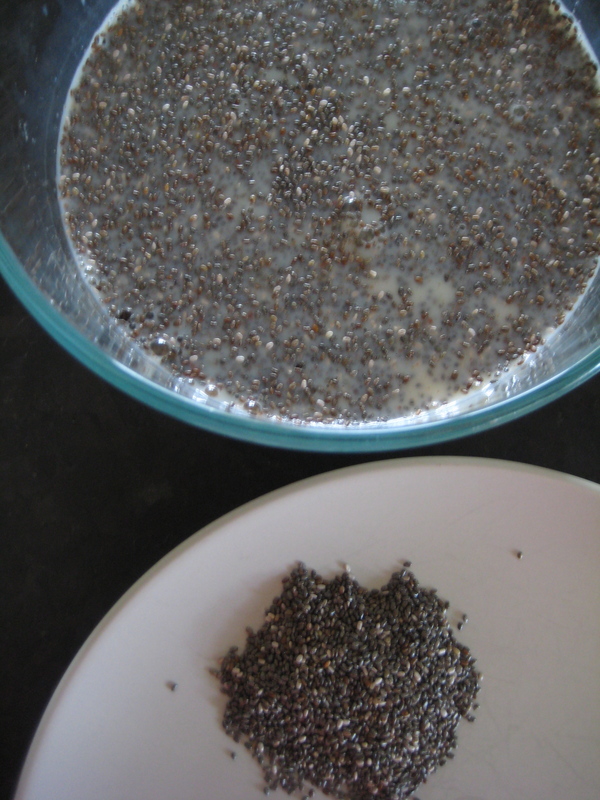 It was very cool how over night the chia seeds expanded and thickened the liquid, like little baby tapioca’s. T said they looked like snake eyes, ah, okay. T being my adult husband ;). Mix the ingredients together. Cover and put in the fridge. I checked on it once or twice the first day, and gave it a bit of a stir because I saw the seeds settling to the bottom. After a day or so in the fridge it was ready to eat. You have to try this. It was delicious. A perfect dessert and if you have kids, a perfect kitchen experiment to understand the cool things food does. I don’t usually buy sweetened soy or almond milks, but this was an exception. I will try making it with unsweetened and add my own vanilla flavour. I don’t think my home-made almond milk would work well, it tends to separate a bit and I have to shake it each morning to use. I’ll keep experimenting though.